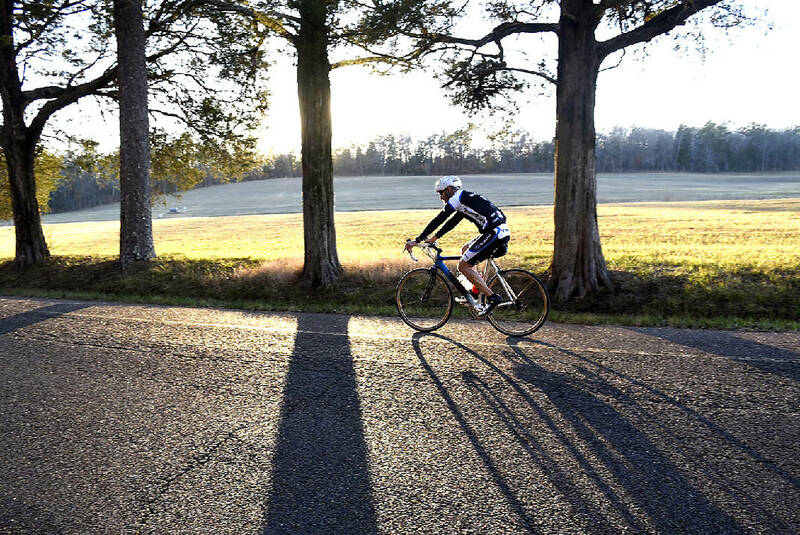 Staff file photo by Robin Rudd / A cyclist casts long evening shadows as rides along the Dyer Field in Chickamauga National Military Park in 2015. When: Thursday, April 13, 5-7 p.m. The looming completion of two local greenways will finish a long-anticipated 25-mile arc of multi-use paths through Chattanooga, and it could just be the beginning for the area's growing network of urban trails. As the last bits of the Tennessee Riverwalk and South Chickamauga Creek Greenway come together, local philanthropists and planners are establishing a vision for the next generation of greenways, with some hoping a proposed expansion through North Georgia will elevate the trail system from a local amenity to a national tourism destination. A proposed multi-use trail called the ChickChatt Greenway would travel around the southern end of the Chickamauga battlefield, connecting East Ridge to St. Elmo. Combining with the riverwalk and South Chickamauga Creek Greenway, it would create a 55-mile, continuous-path loop for cyclists and pedestrians. The concept is a regional highlight among several bicycle and pedestrian paths proposed for North Georgia in a draft feasibility study presented recently to the Chattanooga-Hamilton County/North Georgia Transportation Planning Organization. Paths in the study, including the ChickChatt Greenway, "are planning suggestions at this point as the plan has not been locally adopted, so routes and connections may change," said Julianne Meadows, Northwest Georgia Regional Commission director of regional planning, in an email. The public will have a chance to weigh in on the study on April 13 in Ringgold, but there is already local momentum behind the idea. "It would make the region a world-class tourism destination," said Jim Johnson, a member of the project's steering committee. Johnson, who helps travelers book bike tours of Europe as president of biketours.com, elicited cheers when he announced the ChickChatt Greenway concept to a group of cycling enthusiasts at a BikeWalk Tennessee fundraising event last month. The Lyndhurst Foundation is helping fund the feasibility study along with the Federal Highway Administration. Johnson pushed for the study last year after attending a conference in Carrolton, Ga., where he found inspiration in the community's 18-mile greenbelt loop that some use as transportation to the community's schools. "I came back from that conference," Johnson said, "and thought, 'OK, we've got the Riverwalk going pretty much to St. Elmo, and we've got the South Chickamauga Creek Greenway connecting soon to Camp Jordan, and we have a whole bunch of people saying, 'Wouldn't it be great to ride safely to the battlefield?' So then a light when off in my brain, as it sometimes does." Johnson believes the ChickChatt Greenway could rival the Silver Comet, a paved rail-trail that stretches 61.5 miles from the western outskirts of Atlanta to the Alabama state line. Economic impact studies have shown the Silver Comet generates $57 million in annual economic impact. The ChickChatt Greenway would feature better scenery and could have a similar economic benefit, Johnson said. A presentation on the study draft prepared by Ragan & Smith, the project's consultant, said the proposed routes are being established based on opportunities to connect communities, key points of interest and commerce, existing multi-use paths and natural or historic features. Linking existing places of commerce and stimulating more tourism potential is listed first in the project's goals. In Chattanooga, roughly a mile of the Tennessee Riverwalk and three miles of the South Chickamauga Creek Greenway are left to be complete before the two will connect fully from East Ridge to St. Elmo. Both are expected to be completed under the city's five-year capital plan for open spaces, according to city Open Spaces Director Lori Goerlich. Chattanooga is not included in the North Georgia feasibility study, but the city is beginning to look at a long-term plan, Goerlich said. "Big picture, Open Spaces is exploring a comprehensive Parks and Greenways Master Plan for the City of Chattanooga," Goerlich wrote in an email. "The existing Parks and Recreation Master Plan is about 20 years old. An updated plan that considers all the changes since that time, and reflects our community's interests, neighborhoods, natural areas, and growing economy can be a comprehensive visioning guide for future park and greenway expansion." Rick Wood, Tennessee state director of the Trust for Public Land, said recently it's still possible that his organization could explore a westward expansion of the Riverwalk into Marion County in the coming decades, too. Johnson is also working with local planners on a conceptual North Shore Greenway that would tie in with the local trail system. When he announced the ChickChatt Greenway concept at the BikeWalk Tennessee fundraiser, he joked that he hopes to still be alive when the vision for a 55-mile greenway loop comes to fruition. They better make it wheelchair accessible, just in case, he joked. "Is it something that's going to happen in five years? Ten years? Probably not," Johnson said. "But the riverwalk has been a vision for 30 years, and if we'd waited for a time when it could happen in five years, none of these things would happen. It has to start with a vision and eventually, over time, things come together."